Richmond Mayor Gayle McLaughlin said the city is "stepping into the void with a local principal reduction program" after other attempts to stem foreclosures failed. The California city of Richmond said Tuesday that it's ready to take an extraordinary step in its bid to stop foreclosures -- threatening to wrest mortgages from the investors who now control them. As a first step, the San Francisco Bay city said it will work with an investment firm to try to purchase mortgages of underwater homeowners at a price well below their current balances. It would then try to get those loans restructured to make them affordable. Eminent domain is the legal principle that lets government entities purchase land or structures, usually from reluctant owners who don't want to sell. It is typically invoked for public uses such as parks, roads or utilities -- not mortgages. In the case of Richmond, the city argues that eminent domain is in the public interest because it could let people stay in their homes and help keep neighborhoods, especially minority communities and low-income neighborhoods, from fraying. "After years of waiting for a comprehensive fix, we're stepping into the void with a local principal reduction program," said Gayle McLaughlin, mayor of Richmond. The idea is controversial and reflects the frustration, seven years after the housing market started to collapse, of homeowners and officials in areas that are still reeling. The Richmond plan was proposed by a private backer, Mortgage Resolution Partners, which will find the money the city needs to buy the mortgages. It stands to profit by taking a cut when the loans are refinanced. There's no question the housing meltdown has thwacked Richmond. The median home price peaked at about $460,000 in early 2006, according to real estate website Zillow. Today, it is $206,000. That means a family that purchased at the top of the market could still owe twice the current value of its home. 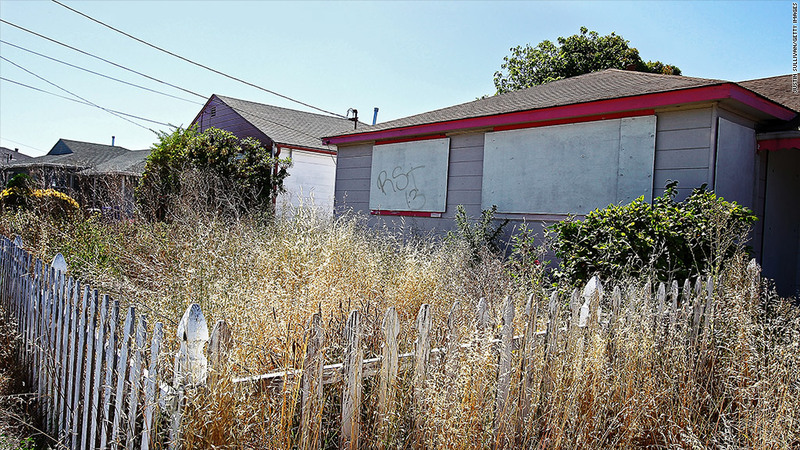 The idea of invoking eminent domain has been considered but rejected by other localities, including Chicago and San Bernardino, another California city hit hard by the real estate collapse. Richmond's efforts are likely to draw court challenges from investors and others who hold the current mortgages and stand to lose financially, experts said. And banks could be scared off lending to homeowners in Richmond in the future. "Eminent domain refinancing may offer temporary benefits to underwater borrowers in specific markets, but there will be longer-term harm as lenders are likely to pull out of those markets and mortgage financing costs across the board are likely to rise," said Jaret Seiberg, a banking analyst at Guggenheim Partners. Richmond homeowner Morris LeGrande, however, said the city is already paying a big price for the severely underwater mortgages. Borrowers paying off bloated loans have less money to spend at businesses in town. And the homes lost to foreclosure can blight entire neighborhoods, lower property values for every homeowner and contribute to crime. "We want the city to purchase the loans at fair market value so we can manage our lives more effectively and economically," he said.